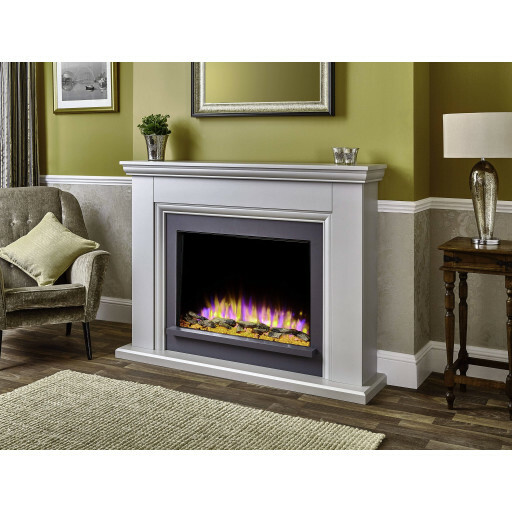 Place this lovely electric fireplace suite in a dining room, a den, a living room, or a lobby to add warmth and charm to the premises. Its sleek, simple lines function well with virtually any interior design scheme. Both vintage and modern architectural surroundings benefit from this stunning addition. The Fireplace Warehouse offers the superbly constructed Katell Valdina electric fireplace auite in five available finishes. Select White, Natural Oak, Pearlescent Myst, Pearlescent River, or Pearlescent Sand shades for the surround. These tones help highlight the remarkable electric fire and hearth LED flame effect to optimal advantage. The fuel bed incorporates realistic appearing logs, as well as transparent pebbles. One aspect of this high tech product will especially delight customers who appreciate automation. The Katell Valdina electric fireplace suite utilises a sophisticated remote control system. It permits owners to specify the unit's performance for up to a full week in advance. Program the thermostat level digitally for additional convenience. We wanted a nice gas fire but our flue failed the smoke test so we decided to go with electric. We bought the Valdina suite and it is far nicer than any of the gas ones I had my eye on, and no fitting cost either. I am so glad Fate stepped in.